berries are an absolute favourite of mine. the only problem is that sometimes, because i don’t know what to choose, i get carried away and pick up too many packs of various types of berries and the question then arises of what to do with them before they turn to mush. freezing excess berries is always a good option as is adding them to smoothies (fresh or frozen berries are fine). pavlova is always a good choice too. 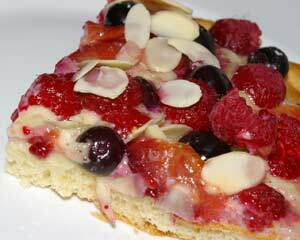 and now i have something else to fall back on – berry galette. this galette is made using a brioche dough for the base. i’ve never made brioche before and this ottolenghi recipe worked really well and was quite simple, so well worth the effort. this is my contribution to the summer edition of “waiter there’s something in my…” which is hosted by johanna the passionate cook, and has picnic food as it’s theme. this galette is easily transportable and would make a nice change from cake for you sweet-toothed picnickers. this dough needs to be started a day before you need it. i made mine 2 days in advance and it was fine. mix the water and yeast together in the bowl of an electric mixer and leave for 10 minutes for the yeast to activate. stir gently with your finger to dissolve all the yeast. add the rest of the brioche ingredients, apart from the butter, and mix together with a spatula until the flour is incorporated. attaché the bowl to the mixer and work on a low speed for 3 minutes. the dough should become smooth but will stick to the bowl (or not in my case!). once it has reached this stage scrape it off the sides of the bowl, increase the speed of the machine to medium-high and start adding the diced butter. do this gradually, making sure each piece of butter is more or less incorporated into the dough before adding more. once all the butter is in keep the machine working until the dough is shiny, has no lumps of butter and comes away naturally from the sides of the bowl. this will take c10 minutes, the dough will be lukewarm, make sure it doesn’t get too hot. once or twice during the mixing process, you might need to stop the machine and scrape the bowl clean. remove the dough from the mixer and place in a lightly greased bowl that is twice as large as the dough. cover with cling film and leave at room temperature for 1 hour to rise. then place in a fridge for 14-24 hours before using (i left mine in the fridge for c48 hours). preheat the oven to 170c. remove the dough from the fridge and, on a lightly floured surface, roll it into out so it is slightly larger than the tray you’re going to place it on (the ottolenghi recipe suggests rolling it out until it is 2cm thick, mine was much thinner, more like 8mm). using a pastry brush, lightly brush the edge or the dough with water, and then fold the edges in to create a border 1cm thick. transfer to a lightly floured baking tray, prick all over with a fork and cover loosely with cling film. place in a warm place and leave to rise by about half its volume. mix the mascarpone, crème fraiche and icing sugar together (you could add some vanilla too if you like). spread this over the dough, being careful not press down to hard. 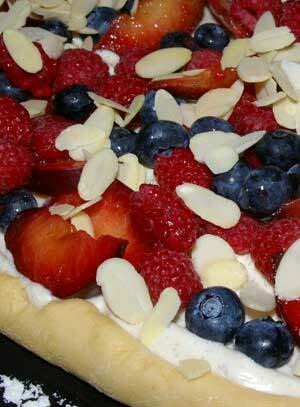 top with the plums, berries and flaked almonds. bake for 25-30 minutes. check the base by lifting with a palette knife to make sure it is evenly coloured. transfer to a wire rack and leave to cool slightly.